Slow cooking is a great way of ensuring your family can enhjoy the benefit of great home made,healthy and tasty food no matter how busy your schedule…. A great side dish to free up your time so that you can really go to town on your main meat recipes: Cleaned new potatoes or desiree, or maris piper – peeled or skin on, this works well with most varieties of potatoes – cut in approx 1 inch size cubes (whole if small). It’s pretty flexible. Crushed garlic, s&p, chopped carrot and celery, fennel and parsnip if you like – pretty much any veg you like *except* the brassicas (cabbage family). 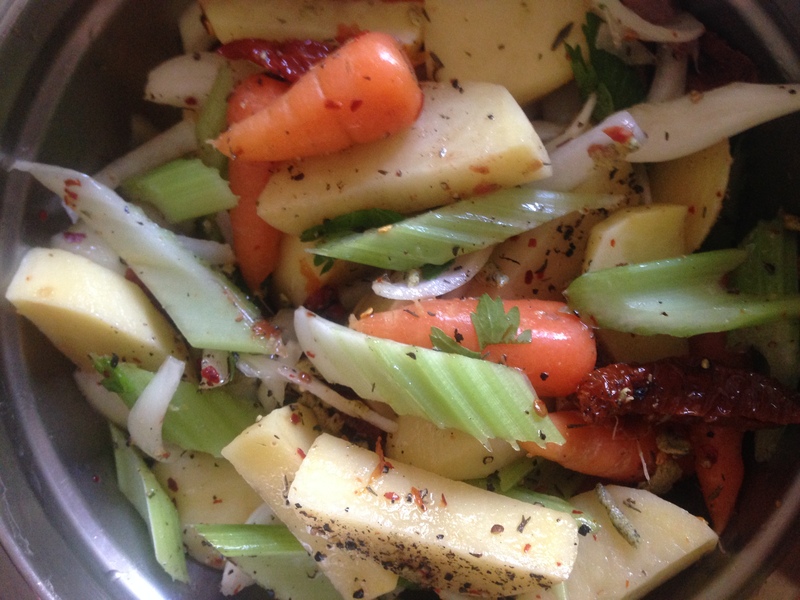 Mix well with a veg stock cube (dry), chilli flakes, squirt of lime or lemon and zest; thyme and / or rosemary. Prep in a bowl and then pour out onto greaseproof paper in slow cooker. Put a tea towel under the lid to absorb condensation so that the the ingredients don’t become ‘soggy’. Cook on low for about 5 hours for optimum caramalisation and rich flavour – note dry cooking can damage ceramic bowl models but works really well in non stick bowl models like Morphy Richards.